Use the text on the left for the text for your social media posts (or write your own) along with the corresponding images. Posts with graphics stand out more. Double-click on the image to download it. Plan before you party, even if you're walking. Find a sober driver, spend the night or take a cab. Don't walk drunk or high. Take steps for safety -- make eye contact, wear bright or reflective clothes, use a light at night. Impairment isn't just deadly behind the wheel -- 43% of pedestrian deaths involved a pedestrian who was impaired. Crash on the couch, not the crosswalk. Don't walk home drunk or high. Don't "walk on the wild side." 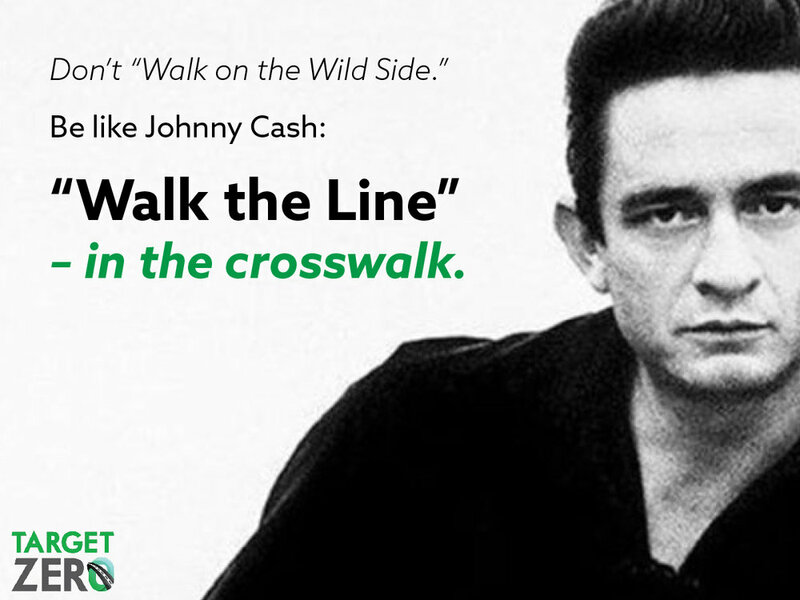 Be like Johnny Cash and "Walk the Line" -- in the crosswalk. 72% of pedestrian fatalities occur outside a crosswalk or intersection. Drive safe for pedestrians. Stop for pedestrians in intersections and crosswalks. Does your child walk to school or the bus stop? Teach them to look both ways when crossing the street. Children are pedestrians too: Have them wear bright or reflective clothing when walking to school or the bus stop.